Aesthetics is a very important thing, especially on concrete surfaces. A pool deck, driveway, patio concrete or any interior floor could surely be aesthetically pleasing and functional as well. How? With decorative concrete. No matter how limited one’s budget is, there is a suitable decorative concrete solution, be it an indoor or outdoor space, a residential or a commercial one. There are various decorative concrete overlays and coatings that can be used to restore concrete surfaces. There is also a broad range of colors, patterns, and designs to choose from, each one providing satisfaction for every property owner’s whims and desires. Stamped overlays with its realistic concrete stamp patterns, textures and colors. Staining concrete offers a variety of colors to mix and match, Spray knockdown finish which is a perfect way to acquire a non-skid and cool surface to walk on. Epoxy and polyurea polyaspartic coatings provide tough surfaces that are resistant to any damage imaginable. Polished concrete for luxurious looking yet economical and functional interior floor solution. Color – Overall cost may vary depending on which type of concrete stain you wish to use. Stains offer a wide range of colors and the number of colors used as well as the method of application, be it manual or not, could affect total costs. Pattern – The complexity of a stamped, scored, or engraved pattern can influence how much a job would be. Simple and traditional patterns like brick or tile can be easier to do and would require minimal labor. Natural stone patterns, on the other hand, may require more manpower and more tedious procedures. Size of Job – Larger spaces require more material, labor, and time. This, of course, would easily determine how much a project would cost. However, there are certain instances when smaller spaces would cost more especially if it would involve smaller equipment and a limited space for installers to operate in. Custom Add-Ons – Any additional request or service may possibly incur additional charges as well. Add-ons include custom scoring, engraving, the addition of expansion joints, and the like. Know the decorative concrete options suitable for you. Call (773)377-8976 today. 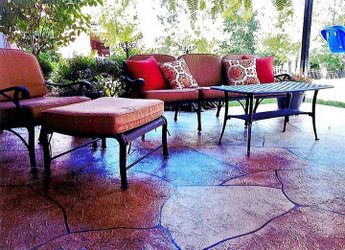 Decorative concrete has definitely taken the remodeling world by storm. It was almost unimaginable to have concrete floor solutions that actually surpass expectations despite the minimal investment. Chicago Concrete Resurfacing, the trusted decorative concrete contractor in Chicago, aims to provide all that and more. We have 20+ years of decorative concrete repair, resurfacing, and refinishing for pool decks, patios, driveways, interior floors, garage flooring, and more. If you want more details and a quick look at how much it would cost, please do give us a call. We’ll schedule a free consultation for your right in your own home.